I found some similar questions on here, but was unable to apply the solutions that were provided. It appears that the site url (https://jewelbound.com) should be at the bottom, connected to the "/wp-login.php?action......"
To answer your specific question, "How can I modify the default reset (lost) password email text," the answer would be to use the retrieve_password_message filter. And ultimately that might be a way to solve your problem. But I think you need to dig a little deeper to figure out what's really going on. 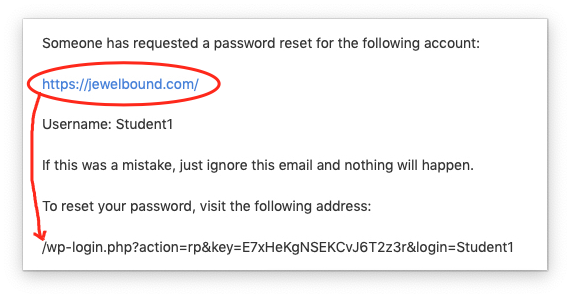 In your question you asked about modifying the "default reset password email text" but what you actually have isn't the real default. If it was, the URL string would all be together, not separated as it is now. I would start by deactivating all plugins and switching over from whatever theme is being used to use the WP default theme. In other words, a very basic install with no interference. Try it then. If you don't get the same result, then somewhere there is something that is messing up the URL. There are filters for retrieve_password_message and network_site_url that could allow for some filter function somewhere to be causing your issue. Disabling plugins and using a basic theme without modification should lead you to discover if that's the case. Ultimately, if you can't trace it down, then rewriting the entire message content in the context of the retrieve_password_message filter will give you a work-around from whatever the problem is. The filter below reproduces the default message. It includes a potential workaround of the URL generation in case something hooked to network_site_url is the culprit. If it is, use the alternative and hardcode the domain as indicated. // Start with the default content. // Return the filtered message. Not the answer you're looking for? Browse other questions tagged templates login email password wp-login-form or ask your own question.